A quiet day doing a few odd jobs. I think I might have found a location for the external 12V power socket. It needs to be on the cabin stern bulkhead and preferably close to the nearest power source inside the boat. 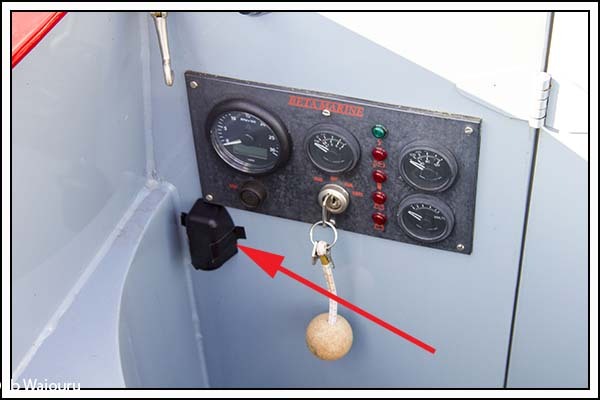 The problem is the port stern cabin door which will bang against the outlet socket housing. My solution was to make a temporary fix using duct tape which then enabled me to move the socket around until I could find a suitable location. The above location clears the door problem but creates another. The mounting block is screwed to the bulkhead using a machine screw either side of the housing and there isn’t sufficient room to fit a drill into this area to drill and thread the required holes. However I’ve come up with another idea for fixing the mounting to the bulkhead. I’ll use some of the Sikaflex we bought to fit the glass splashback. But rather than rush into the job I’m going to think about it for a few more days. The boater moored behind us knocked on the side hatch around 10.00am to warn us he was about to start his engine and that it was both noisy and produced large amounts of smoke. We thought that was very considerate of him and promptly closed up the back of the boat. Just before lunch I walked into Birmingham city centre to buy some bread from the Tesco Metro. It didn’t open until noon which left some spare time to wander around. 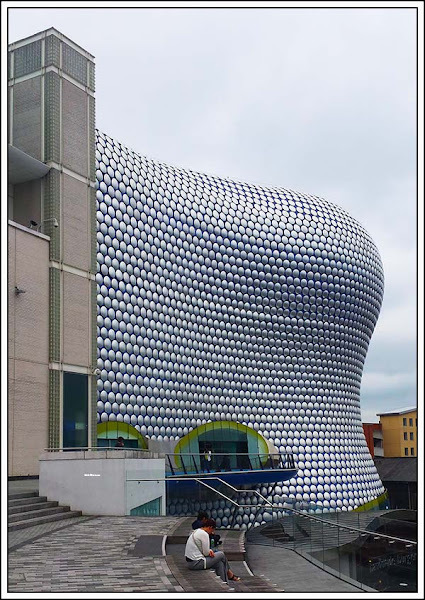 I think this building is part of the “Bullring” shopping centre. Interesting looking cladding and shape. Back at the boat and a change of plans. The bread would be eaten for dinner and we’d have a Sunday roast at one of the local pubs. In the end we decided on the Malthouse. Jan opted for the traditional roast beef whilst I chose the steak and ale pie. The meal was nothing spectacular. Waiouru had been making a ticking sound coming up the Farmers Bridge Flight yesterday which usually means there is something around the propeller. Back down the weed hatch where I found a collection of thorns and light branches together in the remains of a black plastic bag all bound together with fishing line. It took the bread knife to clear the shaft. No….. I didn’t use Jan’s galley bread knife! Mid afternoon and there was a second knock at the side hatch. We looked out to see Diane (nb Ferndale) at the lock. We knew they were in the area but were expecting to see them tomorrow. Ray’s head eventually appeared as Ferndale rose in the top lock. During a brief conversation Diane mentioned we probably would have seen them yesterday on the 48 Hour moorings at Lister Street Bridge except we were looking for a phantom mooring in the opposite direction. Then Jan realised we hadn’t taken a photo and a scramble followed to find a camera. In our haste I only managed to take three photos and two were blurred. 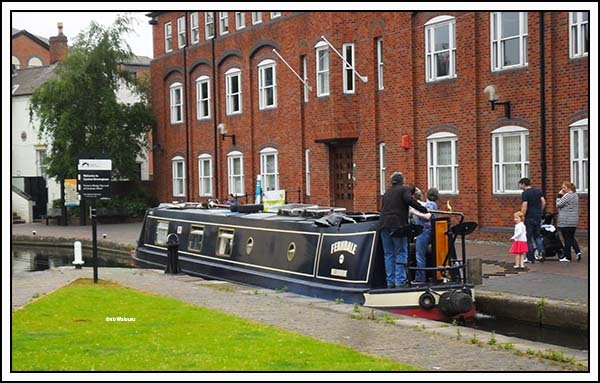 However I did manage one photo of Ray’s back as Ferndale exited the lock. Tentative plans to catch up tomorrow!